The Intel® Core™ i7-900 mobile processor Extreme Edition series, Intel® Core™ i7-800 and i7-700 mobile processor series are the next generation of 64-bit, multi-core mobile processors built on 45-nanometer process technology. Based on the low-power and high-performance Intel® microarchitecture code name Nehalem, these processors are designed for a two-chip platform consisting of a processor and an... Intel® 5 Series Chipset. The Intel® Core™ i7 mobile processor family features four processor cores, an integrated memory controller (IMC), and an integrated I/O (IIO) (PCI Express* and DMI) on a single-silicon die. This single-die solution is known as a monolithic processor. 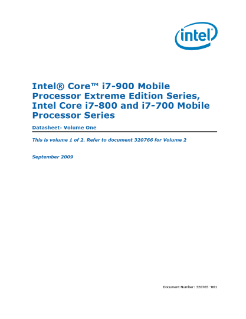 This document provides DC and AC electrical specifications, signal integrity, differential signaling specifications, pinout and signal definitions, interface functional descriptions, thermal specifications, and additional feature information pertinent to the implementation and operation of the processor on its respective platform.